Full dinnerware set for baby. For children aged 6 months and more. 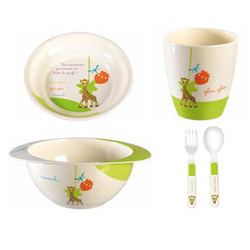 DescriptionThis Sophie the giraffe meal set will pleased baby and parents and make lunches and dinners much easier when out of home. 1 plate, 1 bowl, 1 cup, 1 stainless spoon and fork. For children aged 6 months and more. To complete a highchair or booster seat rental, this Sophie the giraffe set will make baby or toddler meals easier when staying in Paris with baby. Baby will recognize Sophie and will discover the draw at bottom of the plate or bowl while eating. This set includes a plate, a bowl with 2 handles so that your toddler can take it easily, a cup and toddler stainless cutelry - a spoon and a fork - conceived for toddler's littles hands.